To me, Easter always signals the beginning of spring. 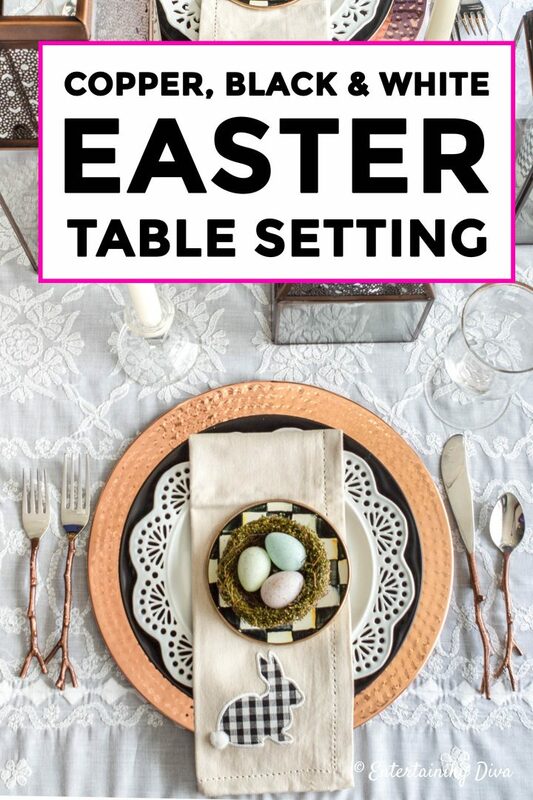 Which is why I usually do spring-colored Easter tablescapes like last year’s Easter table decor in pink and green, and the year before’s table in fuchsia and white. 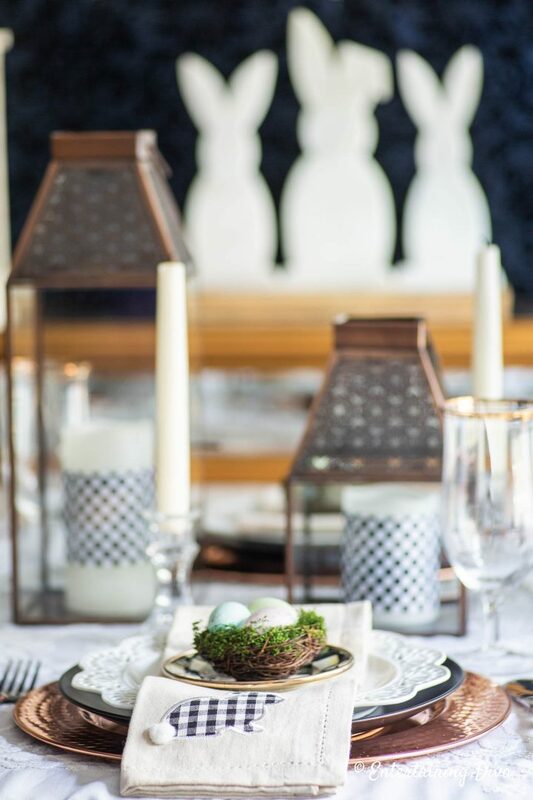 But this year I decided to break with the tradition and go in a totally different direction by doing a copper, black and white Easter table setting. 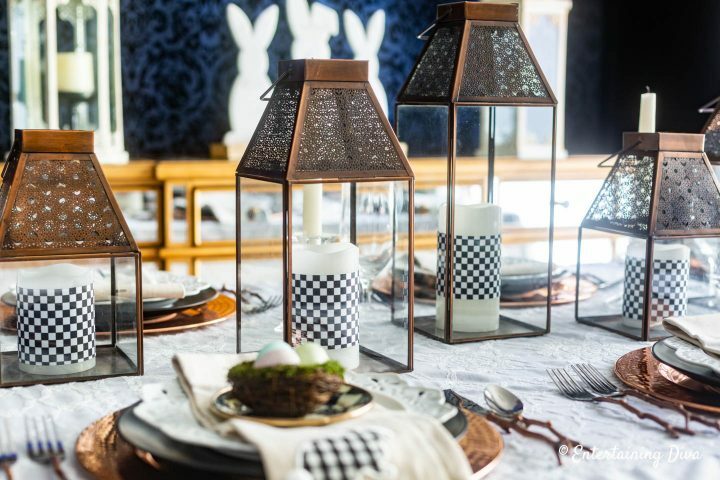 Ever since I saw all of the black and white buffalo check decorations everyone was doing at Christmas, I’ve been wanting to create a buffalo check tablescape. But I didn’t have a good excuse to do it…until now! 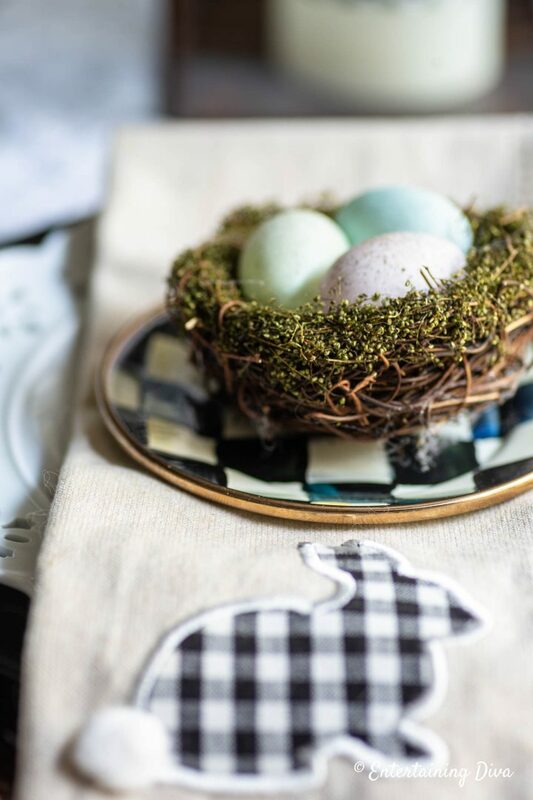 When I saw these really cute black and white gingham bunny napkins*, there basically wasn’t any thinking involved. I knew what my color scheme was going to be for Easter. 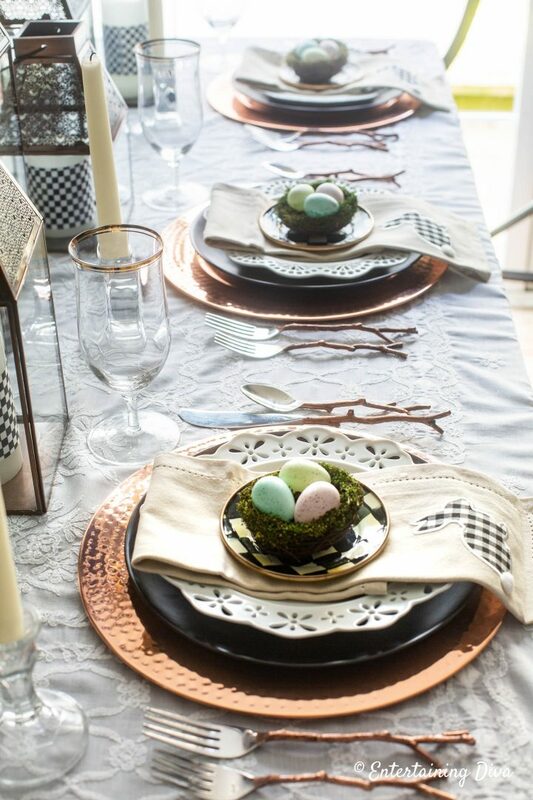 I know black isn’t a traditional Easter color, but combined with a lot of white and my new obsession for copper, I love the way it turned out. 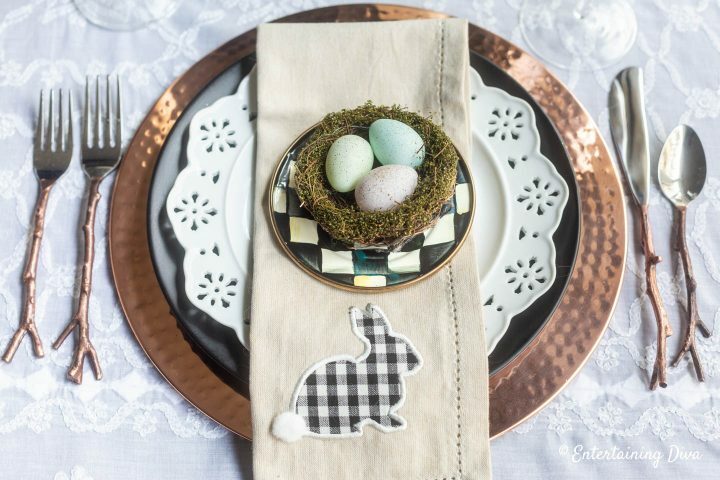 Keep reading to see my copper, black and white Easter table setting. Since the napkins were the inspiration for the table, they take center stage on the place setting. 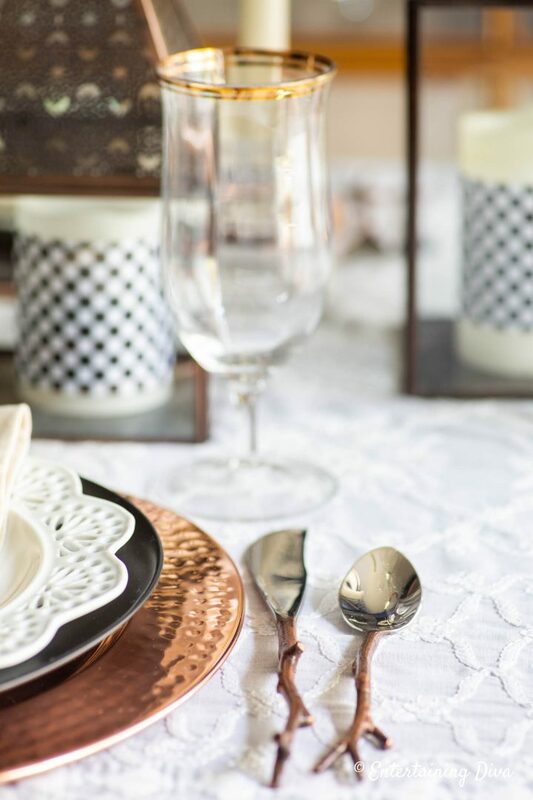 I laid them out on top of this copper charger*, these matte black plates* and a lacy white accent plate (no longer available) that complements the embroidered tablecloth. The black and white check appetizer plates* were a bit of a splurge. But I really love their hand-painted look. And the way the pattern on the plates echoes the buffalo check on the napkins. 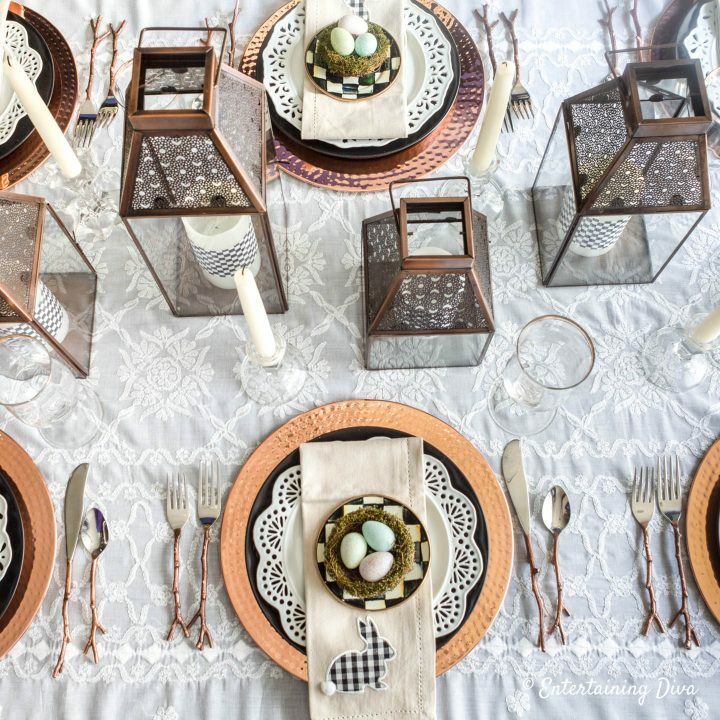 Then I reused the copper-colored twig cutlery* from last year’s fall copper tablescape. And some gold-rimmed water glasses finish the place setting. 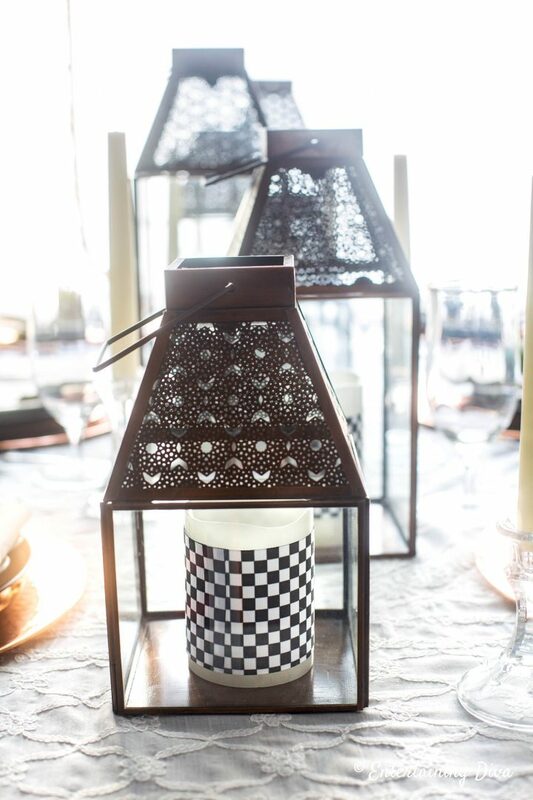 To keep the centerpiece relatively simple, I decided to use different sizes of copper lanterns. 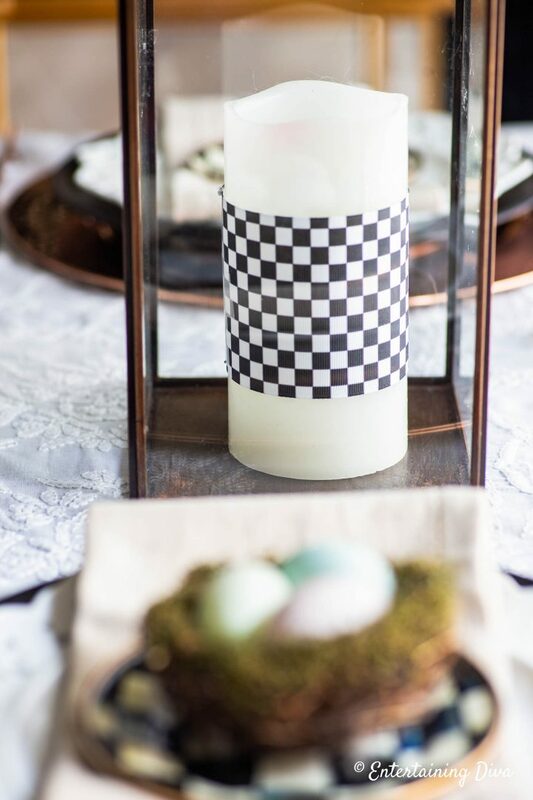 Wrapping some checkered ribbon around white flameless candles* is an easy (and inexpensive) way to continue the black and white Easter place setting color scheme into the centerpiece. I used scotch tape to hold it on the candle. Since the candles are flameless, I don’t have to worry about the ribbon burning. 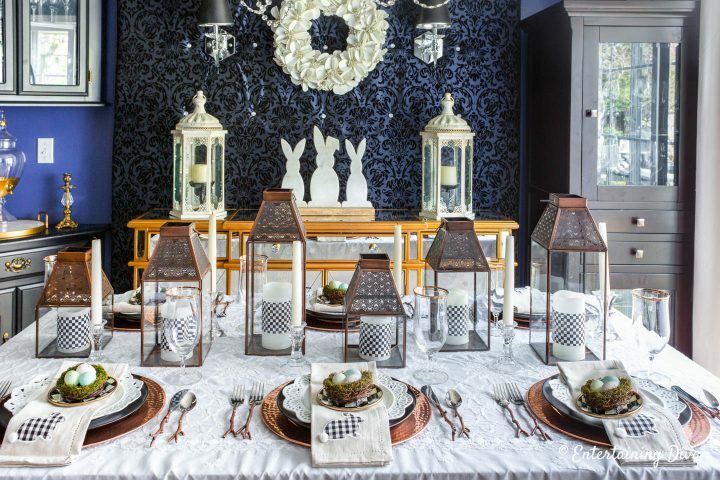 The ribbon around the candles really helps to tie the whole table setting together. Some plain white taper candles in plain glass candle holders adds a little height to the table without blocking the view across it. 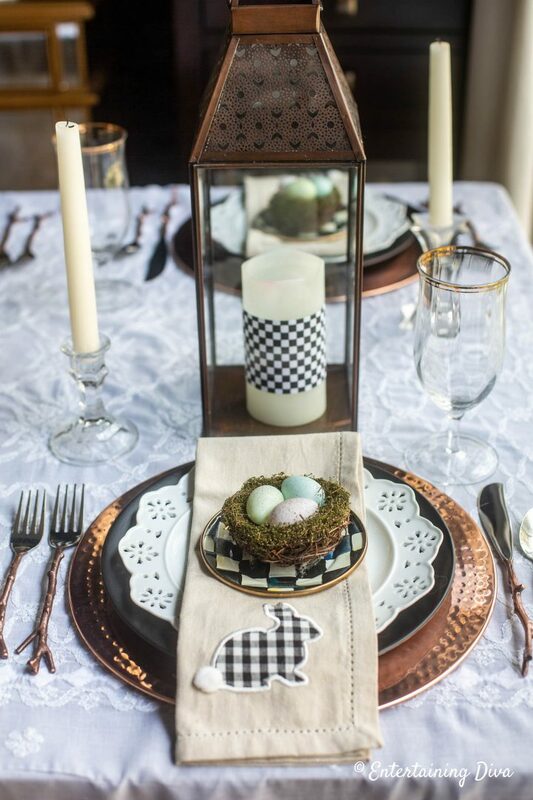 And I always love the look of repeated elements down the center of the table to create a beautiful centerpiece. Since my Easter centerpiece doesn’t have anything in it that is specifically for Easter, I wanted to add some to the buffet behind my table. 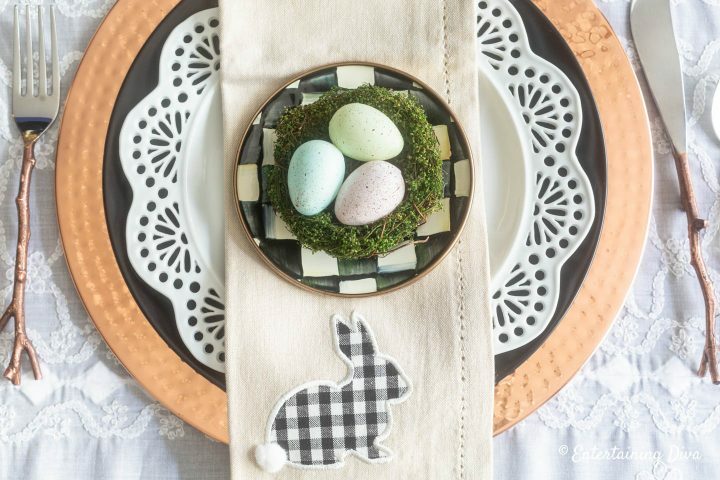 These marble bunnies from last year’s Easter table work perfectly. The white wreath hanging above them is actually a Christmas wreath. But it doesn’t have anything on it that specifically says Christmas and it goes with my black and white color scheme. So I decided to re-use it, too. 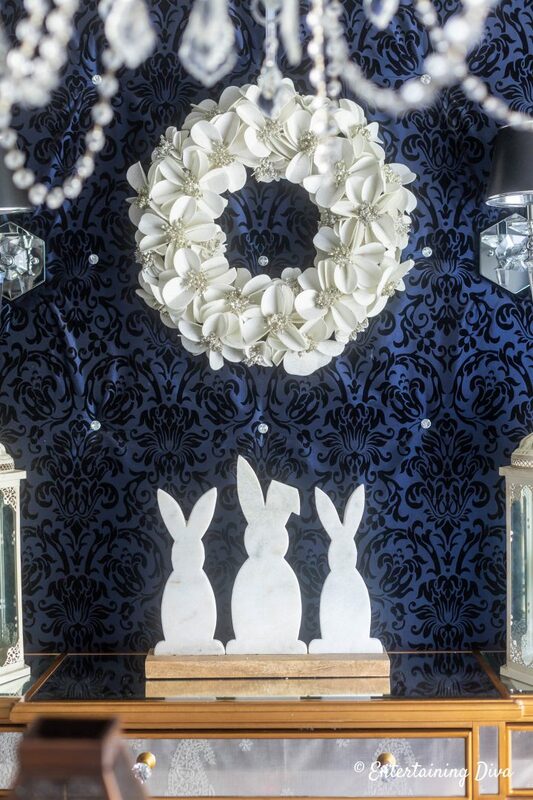 The white bunnies are a big contrast against the dark background behind my buffet. So they are clearly visible from the table. 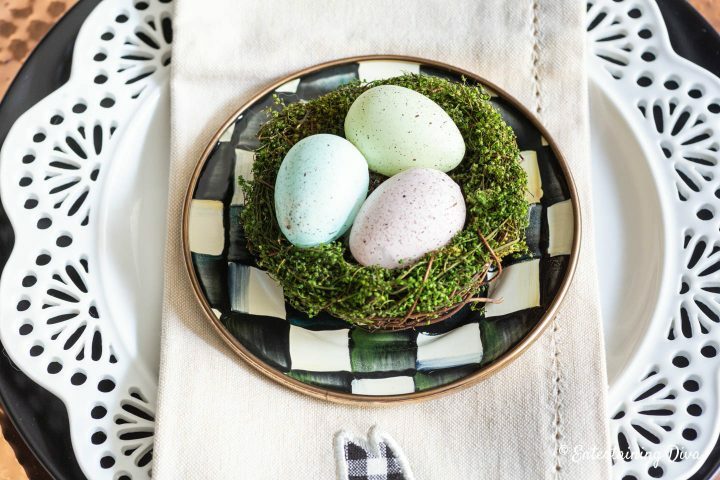 And I love that it feels like Easter even though it isn’t a traditional spring palette. 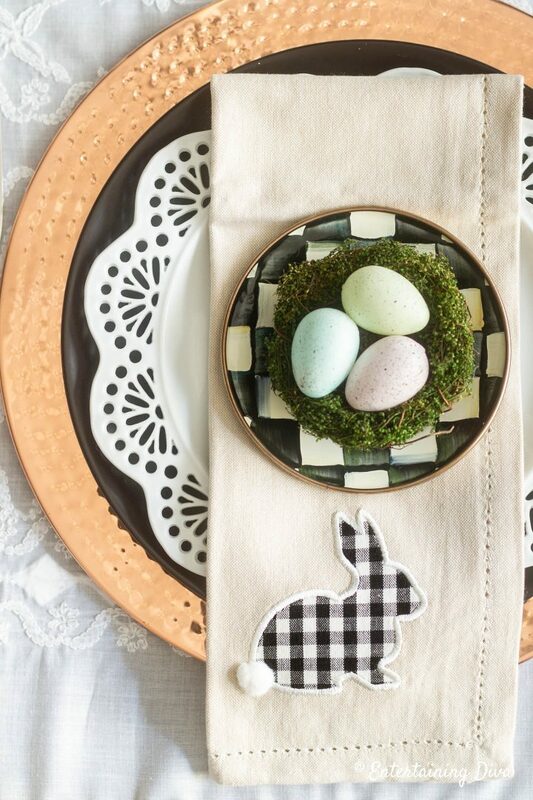 Have comments or questions on our copper, black and white Easter table setting? Tell us in the section below. 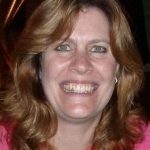 An absolutely delightful and refreshing change – kudos!